The city of Santa Clarita, the Santa Clarita Valley Sheriff’s Station and Valencia High School officials will join in partnership Thursday and Friday, April 12 and 13, to conduct the Every 15 Minutes program at Valencia High School. This emotionally charged program is an event designed to dramatically instill teenagers with the consequences associated with drinking alcohol, reckless driving and life choices. The program will challenge students to think about personal safety and the responsibility of making mature decisions. The main goal of this powerful, high impact and very emotional program is to educate all individuals regarding the severe dangers awaiting those who make these choices, particularly those related to reckless driving, speed contests, drinking alcohol and driving, and now distracted driving and texting. Deputies will join forces with school officials and selected students to “drive” the message home. Several students will be taken from classes on Thursday, as if they had been “lost” in a tragic incident. They will be joined by other student program participants at a driving under the influence (D.U.I.) simulated collision scene, which will be set up near the school for the students to view, depicting fatalities and serious injuries to several students. During many of the programs, the Air-5 rescue helicopter, from the Los Angeles County Sheriff Department’s Aero Bureau, is used to simulate an airlift of a critically injured student to a local hospital. Several other “injured” students will be treated at the scene by the Los Angeles County Fire Department and taken to a local hospital. The drunk driver will be arrested and will be taken to the Santa Clarita Superior Court where a simulated conviction for manslaughter will occur. An assembly will be held at Valencia High School on April 13th for the entire student body where several guest speakers, who had family members killed in crashes in the Santa Clarita Valley in past years, will convey their strong and emotional messages. All involved hope to send a poignant reminder about the dangers associated with poor life choices. All family and community members are encouraged to get involved and frequently talk to their youths about the topics. Credentialed members of the press are invited to attend. For additional information or to participate or contribute to the event, contact Deputy David Shoemaker at 661-799-5110. Partner to prevent or report crime by contacting your local Sheriff’s station. Or if you wish to remain Anonymous, call “LA Crime Stoppers” by dialing 800-222-TIPS (8477), texting the letters TIPLA plus your tip to CRIMES (274637), or using the website, http://lacrimestoppers.org. A free TipSubmit mobile application is now available for the iPhone and Android. The new software tool is an anonymous and fully featured crime tipping mobile application that even allows you to submit images or video. More information at www.tipsoft.com. 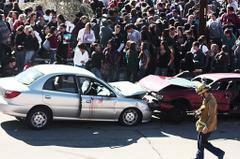 'Every 15 Minutes' Coming to Valencia High Wed.-Thurs.